Imagine you’re taking your regular shower in the morning before you head out for the day. Feel the warm water running over your head. Perhaps you start by washing your hair. Afterward, you wash your face, neck, chest, and back. Then you immediately turn off the water and start to dry off. Right now you’re probably saying that you weren’t finished, you forgot the whole other half of your body. This is basically what you are doing whenever you forget to floss your teeth. Dr. Daniel Weldon, your dentist in Ocala, FL, wants to let you know why it’s so important that you floss every day. As we illustrated in the little story above, whenever you brush your teeth but don’t floss, you are leaving nearly 40% of your teeth’s surfaces uncleaned. Your brush is simply not able to reach in between your teeth and clean those small spaces. Plaque can build up quickly here because the area is so confined. If you haven’t flossed in a few days, the plaque has probably hardened into tartar and will be more difficult to remove. Flossing is helpful when it comes to cleaning your gums. Just like with your teeth, plaque can be damaging to your gums and cause gum disease. This can lead to a variety of symptoms such a swollen or painful gums, bleeding gums, or receding gums. Gum disease is also the leading cause of tooth loss. It has even been shown to be associated with much more serious conditions like diabetes, cardiovascular disease, and stroke. 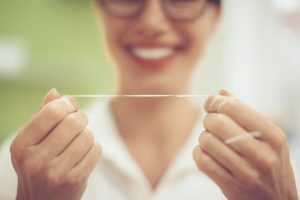 While these are extreme examples of what a lack of flossing can lead to, even the more moderate effects can make a patient experience consistent pain and sensitivity. Use about 18 inches of floss, wind the ends around one finger and each hand, leaving about an inch or two in the middle. Hold the floss firmly so that there is tension in it. This will enable you to slide it up and down between each tooth easily. Gently curve the floss around the base of your teeth so that you clean below the gum line. Don’t use too much force, as this can damage your gums. Flossing takes less than a minute if done correctly. If you find your gums frequently bleeding, be sure to use less force so that they are allowed to heal. It doesn’t matter whether you brush first or second as long as you always floss. Consider them 2 parts of a greater whole that is your dental hygiene routine. Even if you brush and floss diligently, you should still be sure to come see your family dentist in Ocala, FL at least twice a year for a professional cleaning. Even brushing and flossing are not able to clean every single surface on your teeth, and that’s where our team and their specialized tools can help. A professional cleaning can take care of these trouble spots and keep you healthy between visits. If you have any questions about flossing or want more tips for your home routine, please be sure to ask us today.